Call from the police to assist a male who was suffering from violent sickness and stomach cramps and unable to continue. The two males had left Boot with the intention of walking back to Langdale via Scafell and Scafell Pike. 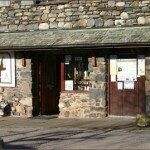 The casualty was taken ill on the Hardrigg Gill path in Kettle Cove on the slopes of Scafell above Burnmoor Tarn. Given the condition of the casualty and the nature of his illness it was decided to ask for assistance from Air ambulance. Team members were on scene when the air ambulance arrived and assisted with the casualty into the aircraft there were ten team members on the hill. Incident started at 15:36. There were 10 Wasdale team members involved and the incident occured at NY19672 05884 (471m).